What Would Getting Dentures Entail? I’m losing my teeth and making some decisions about what to do next. What would it entail to get dentures? Do they put you out and then take out all your teeth at once? Do you get the dentures right away? I’m sorry you’re facing this decision. I know how heartbreaking it can be. 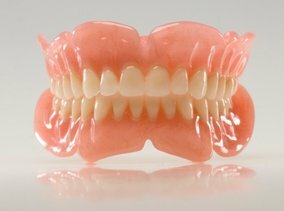 I’ll answer your question about dentures, but before you make a decision I want to be certain you know your options other than full dentures. If you’re removing all your teeth, ideally you’d get dental implants. As you can see from the illustration at the left, it implants a prosthetic root into your jawbone. This is why dental implants are so useful. They’re much more stable than other options. You can eat and brush/floss as you normally would with your normal, healthy teeth. However, their biggest benefit is the prevention of facial collapse. When your teeth are removed, your body immediately begins to reabsorb the minerals in your jawbone to distribute elsewhere throughout your body where they’re more needed. 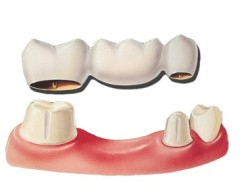 It’s efficient, but the result will be you won’t have enough jawbone left to retain a denture. Dental implants prevent that. Very few people can afford to get an implant placed on every tooth. 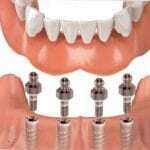 However, implant supported dentures are another option which is more do-able financially. With these, your dentist will place an implant in even distribution throughout your bite. When that’s completed, he can anchor your dentures to them. You get the benefit of preserving a good deal of bone along with having your dentures secure in your mouth. Obviously, the more implants you can afford to place the better, but this can be done with as few as two implants, which are called snap-on dentures. How Are Removable Dentures Placed? First, the teeth are extracted. Some people prefer to have dental sedation for this part of the procedure. This way they can sleep through the procedure if they’d like. Others prefer just to use a local anesthetic. It’s completely up to the patient. Once that is completed, the next step depends on the type of dentures you decide on. These can be placed as soon as your teeth are removed. The benefit is you can walk out with a full set of “teeth”. They tend to end up being a bit more expensive because they require more follow-up visits and adjustments. These are placed about eight weeks after extraction. The benefit is they tend to fit better, requiring less adjustment. The obvious drawback is the wait to have a smile. Discuss these options with your dentist. I’m sure the two of you can come up with what works best for your lifestyle and budget. Hoping you can point me in the right direction. I’m a stuntman and normally have no problems. But, in the last six months, I’ve lost two teeth. That’s quite a spate of bad luck for me. I need to replace those teeth but wondered if dental implants are stronger or a dental bridge. I don’t want anything removable because I’d think that would be a choking hazard. I’m glad you’re taking the time to research this ahead of time. You’re in a unique situation and have to be certain you’re getting the absolute best tooth replacement. Before we discuss your options, I want to make sure you’re wearing a mouthguard during your stunts. If you’re worried about appearance, your dentist can fashion one that will look like teeth. Another thing to consider is whether you’re losing more teeth because of accidents at work or if they’re a little looser than normal because of some gum disease. If that’s the case, you’ll want to have your dentist start treatments right away or you’ll continue to lose teeth. I’m not saying that’s the issue, just that you want to try to pinpoint why you’re losing teeth to see if you can eliminate the issue. Though, you can’t very well do anything about a run of bad luck. 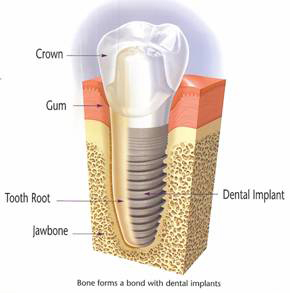 As you can see from the illustration above a dental implant places a prosthetic root into your jawbone, making it the most stable replacement option. The implant mimics your tooth root. After the healing time and the bone has reformed around your dental implant, it will be as strong as your natural teeth were. But, just like you’ve broken your natural teeth, you can break your dental implant if enough force is applied. The other option you asked about was a dental bridge. 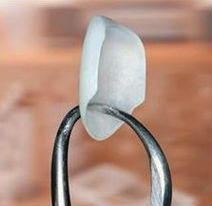 While a dental bridge will be bonded on (see image directly above), it’s not implanted into your jaw. They’re still stable, but not quite as stable as an implant. Because of that dental implants are generally the better choice. However, if the adjacent teeth already need crowns, then a bridge may make more sense, though, you can certainly get more than one dental implant if you wanted. Hopefully, your spate of bad luck will change soon. Help me! I totally blew it at Christmas, apparently. I thought I was listening and being attentive. She’s always complaining about how we have the worst vacuum ever. So, I spent more money than I thought you should on a vacuum. Pro tip: That’s not a good Christmas gift. I wasn’t aware that things you have to have anyway to keep the house clean doesn’t count. She’s been mad at me since Christmas morning. In my defense, I have noticed she is vacuuming more, even if she’s glaring at me while doing it. I’m determined to make it up to her on Valentine’s Day. She also always talks about wanting a smile makeover. So, I thought I’d get her a gift certificate for Invisalign and teeth whitening. I went to see her dentist at lunch today to order it (see I’m actually a month ahead of the game), but he said no. She has to be there for an exam to know the cost. How can I surprise her like that? Will all dentists feel that way? I love how much you’re trying. You’re absolutely listening, so she can’t fault you for that. I think you’ll be able to get her that mini smile makeover you’re hoping to. Before we do that I want to make sure you know a distinction. When your wife says smile makeover, she could be referring to Invisalign and teeth whitening. Many people get beautiful smile makeovers from these two products. Be aware, though, most people are referring to getting a smile makeover with porcelain veneers. Either way, I’d make sure you do some digging to see which she means as you’re trying to make something up to her she was unhappy about. 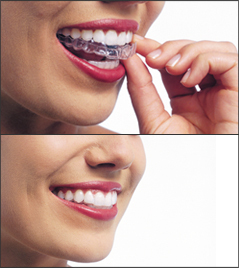 With Invisalign, her teeth will be gently and precisely shifted to a correct position wearing a series of aligners. The image at the top of this post shows a woman placing an Invisalign aligner on her teeth. Can You Pre-purchase Invisalign Ahead of Time? My suggestion, if you want to get an Invisalign Gift Certificate is to talk to the dentist again asking what the minimum cost would be. If he knows your wife’s teeth at all, he can probably give a semi-educated guess. Then purchase a gift certificate for that amount. Let him know after her exam and treatment plan is designed, you’ll make up any cost difference. If it turns out porcelain veneers is what she was after, the dentist you choose to do this is the most important decision you’ll make in this procedure. You really want her to go to a dentist who’s reached accreditation level with the American Academy of Cosmetic Dentistry. Those are the dentists which can give her a stunning smile. Be aware, this procedure is much more pricey than Invisalign. But, you get way more for your buck at the same time. The aacd.com website can help you locate one near your area. This blog is brought to you by American Academy of Cosmetic Dentistry Accredited Dentist Dr. Randall Burba.